The BoBunny Blog: The Essentials! Don't you find that some things in life are just essential? So do we! That's why we know you're going to love our new Essentials! Lots of silver & gold to add a little sparkle to your projects! Oh. My. Heck! Are you drooling yet? How amazing is all of this? 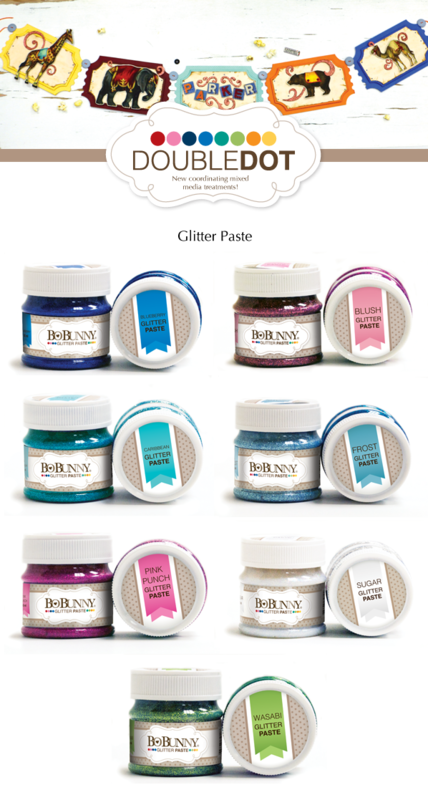 Love the new gorgeous glitter paste colors, the foil rubons, the dies, the...the...EVERYTHING! What do you think? My faves are the pearlescents, the laser cuts and the kraft goodies. Wow! I am lovin' all of it Have a Blessed day, DIANA L.
The lser chipboard is amazing! Stunning dies, masks and stamps, and the laser chipbord I just struck to the heart! He charms! oh my..... love what I see! Great new products. I have some of the first stackable stencils and I love them. No bleeding, no moving, great with pastes, paint or ink. They are fabulous! Really happy to see more designs. I am so excited to try that glitter paste! 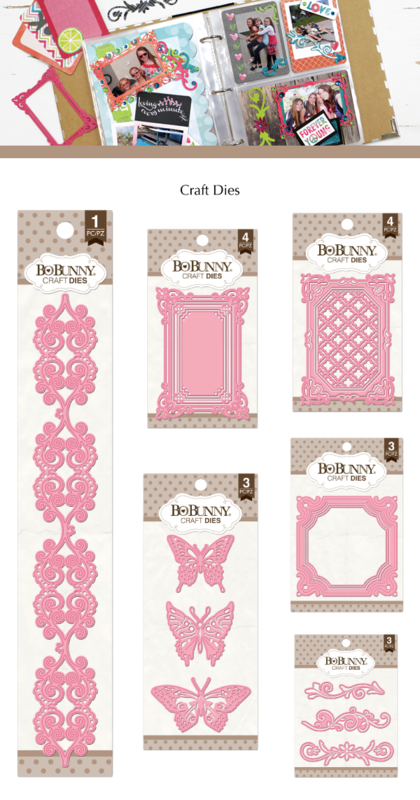 And I always love my BoBunny Double Dot papers/products. I see craft dies and glitter paste in my craft room in the near future...I hope my hubby sees the same thing!!! Oooh, I love it all!!! TOtally love the stickable stencils! Oh My Goodness - I love it all!!! Possibly my favourite of all the collections??? Love the foil rubons, the stencils, the dies. Its all fabulous! So cool! Love the binders and the double dot stickers, but it's all so fun! So pretty!! I love the glitter paste, Kraft pocket squares, stencils and butterfly chipboard. Oh wow Bo Bunny has become the one stop shop for everything! Yeah!! Oh I can already feel my wallet getting much, much lighter! 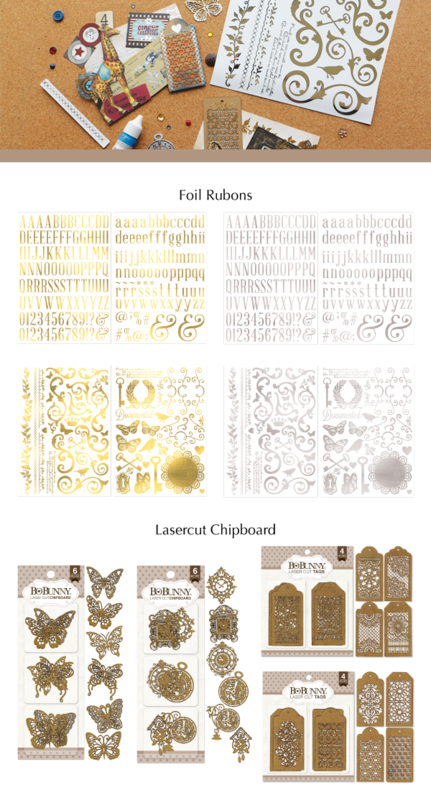 Love the silver and gold and those dies.... Swoon! OH. MY.... These products take the cake! I LOVE it all, especially the Misc Me (every piece of it), the foil rubons, laser cut chipboard, and the new colours of glitter paste ... S.W.O.O.N.!!! So much fabulous new products. Love the stencils and glitter paste. For me-the best thing ever. Those stick on stencils are brilliant-kudos from all of us I am sure. Loving the dies,all the kraft-and the glitter paste has my heart fluttering. You've knocked this one all the way out of the park! Ummmm... I will take it all! Delicous! OMG .......love all of it! The dies are to die for! OMG are Bo Bunny taking over the scrapping world!!! Love the dies, stencils and those rubons are beautiful. Hope they have printed plenty!!! I love it all...but I am so excited about the glitter paste!!! Such awesome colors! LOVE these new ESSENTIAL Essentials!!! Oh my goodness. I need all the glitter paste and the stencils! AMAZING!!! Love new colors, dies and chipboards!